No need for a fancy pastry school degree to master this delicious French Yogurt Cake! Just like the ones the grandmas in France make: moist and fluffy, yet incredibly simple. Most people, myself included, get a little intimidated whenever they read the word “French” in a recipe. But no need for that anxiety here! Save it for a few weeks from now, when we (hopefully!) learn to make croissants. This yogurt cake – or Gâteau au Yaourt, in French – is a walk in the park! It’s one of the first desserts French children learn to bake. Despite its name, it is not considered a French cooking staple. Then why do we call it French Yogurt Cake? Isn’t it just a regular loaf cake, made with yogurt? Well, what makes this cake so charming is that it is made by many grandmothers in France, hence why you can also call it Gâteaux de Mamie (Grandma Cake). And they use little glass jars to measure out all the ingredients! How cute is that? But don’t worry! Since yogurt is sold in several different sizes and shapes here in America, I converted everything to measuring cups and spoons. We lose a little of the rustic charm of the dish, but at least we know that your cake will be perfect every time! To make this cake, simply combine all dry ingredients in a bowl. In a separate (larger) bowl, mix or whisk the eggs, sugar and lemon until pale and fluffy. Add the yogurt, oil and vanilla extract, and mix well. Then add the dry ingredients, gently mixing with a wooden spoon, being careful not to over mix. 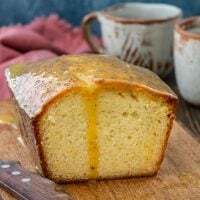 Pour the batter into a loaf pan, coated with cooking spray or oil, and bake in a 350 degrees F oven for about one hour or until a cake tester inserted in the center comes out clean. What happens when you over mix cake batter? “Be careful not to over mix!” I’m sure you see that warning in every cake recipe out there. Well, mixing flour with liquid ingredients activates the gluten proteins that give baked goods their structure. When you over mix the batter, the gluten in the flour can form elastic strands, which will result in a denser and chewier texture. That might not be a big deal in something like cookies, but nobody likes a chewy cake! Especially not when it’s supposed to be light as air, like this French Yogurt Cake. So, while you are free to use a hand mixer and go to town while mixing the other ingredients, I recommend using a wooden spoon when it’s time to kindly and gently combine the dry to the liquid ingredients. Good news! You probably already have most of the following ingredients in your pantry/fridge. Since you’ll only need such few, simple ingredients, make sure they are all fresh and the best quality you can afford. 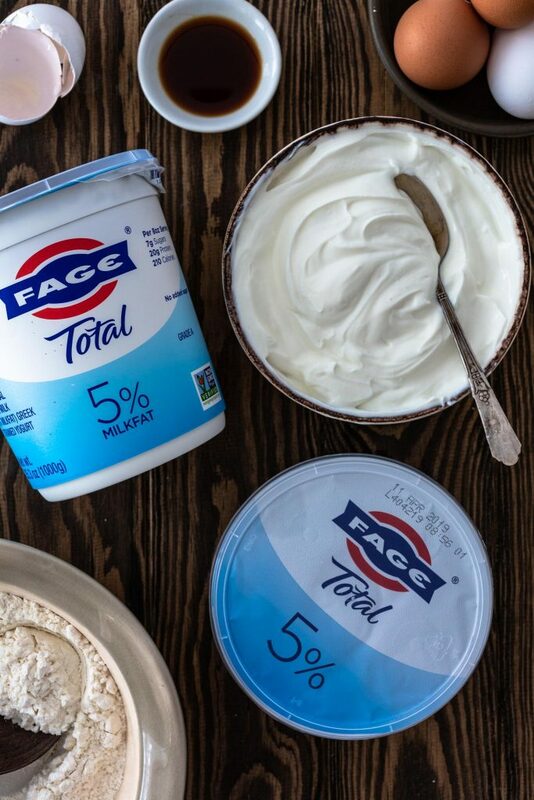 My favorite Greek yogurt brand is FAGE Total. It is an all-natural Greek yogurt with no added sugar, lots of protein and a distinctive rich and creamy taste! I eat a LOT of yogurt, so I can wholeheartedly tell you that FAGE is the best, thickest yogurt out there. And it’s naturally thick too, due to the yogurt being strained, rather than containing added thickeners. It makes it the best choice for an all purpose yogurt – great for cooking or baking with but also for enjoying just as it is! 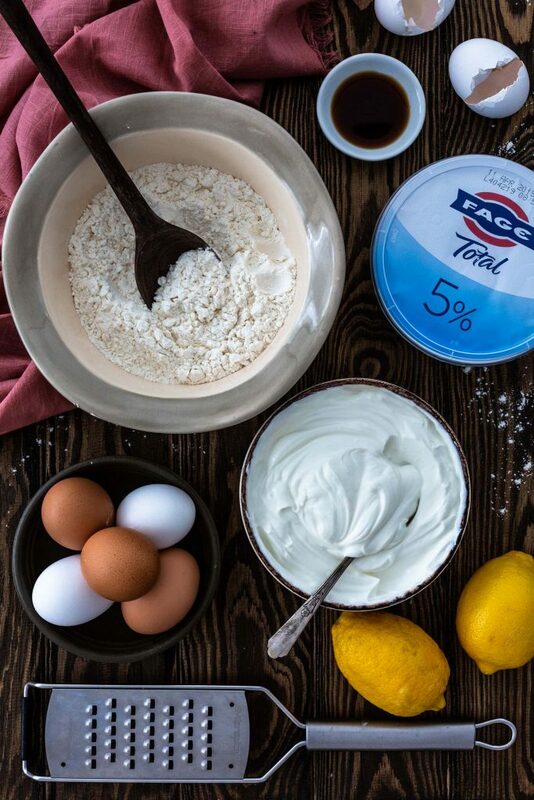 Greek yogurt is a great ingredient for baking. It helps keep baked goods moist and fluffy, while giving them a subtle tanginess that makes them extra delicious. Also, I don’t know about you, but we always have one – or three – containers of Greek yogurt in our fridge. So if I’m doing some impromptu baking, I can count on having it, as opposed to sour cream or buttermilk (which I only buy when I have a plan for them). 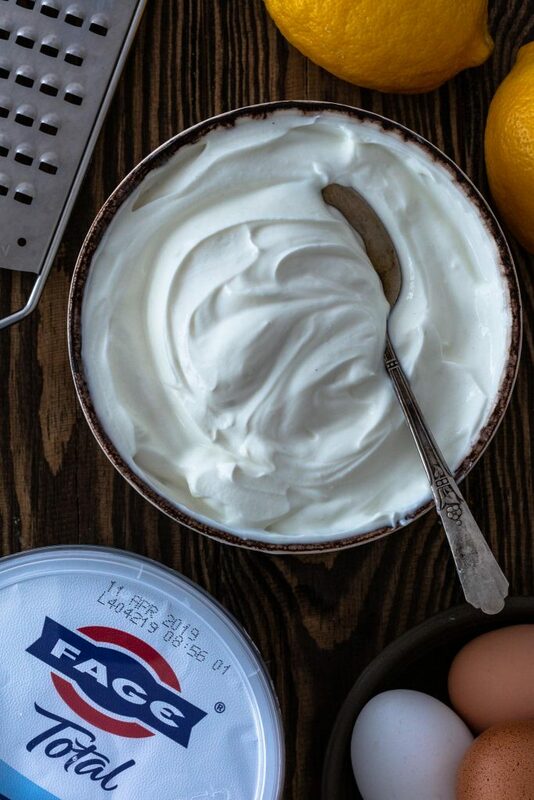 Use plain full fat Greek yogurt, if you can. Preferably FAGE Total 5% Greek Yogurt. That will give you the most control over the flavor and texture of your recipe. I always bake with full fat dairy, as that produces the best results! Thin it out with some milk to use it in place of heavy cream or regular yogurt. Now, that won’t work if you need to whip the heavy cream. But, in that case, you can add a dollop of Greek yogurt for flavor. Use it in place of buttermilk. You might need to add a little milk to get the same consistency, but the flavor will be similar. Substitute for sour cream or crème fraiche. They all have a similar tang and texture, so feel free to swap them out 1:1. While this cake is amazing by itself, preferably served with coffee, I couldn’t resist making a passion fruit yogurt glaze. I’m OBSESSED, you guys! It adds a sweet tropical tang that makes it even more delicious. If you decide to make the glaze, all you’ll need is passion fruit puree, confectioners sugar and yogurt. You just need to reduce the juice and then mix with the sugar and yogurt until thick! I would love to decorate with passion fruit seeds, but since I can rarely get fresh passion fruit here in the US (maybe for like 2 hours in the summer, paying something like $10 per tiny passion fruit! ), I use the frozen stuff and decorate with poppy seeds instead. That is totally optional though! 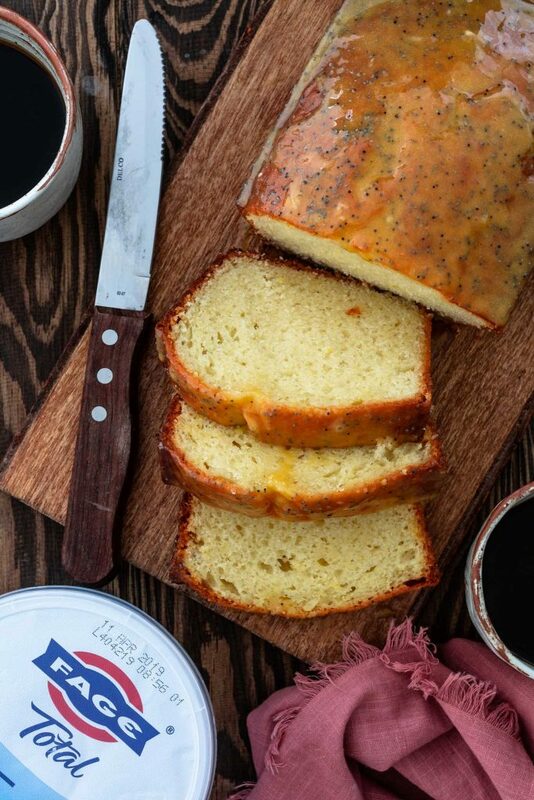 The poppy seeds just add a fun look. The flavor really comes from the out-of-this-world passion fruit glaze! I’m gonna have to start adding it to all the things. Can’t have too much tropical yumminess in our lives, right? But don’t take my word for granted! Make it and try it for yourself! I guarantee you will be licking everything that touches this glaze. My husband has a terrible habit of putting the leftovers in the refrigerator. Drives me nuts! While the flavor remains the same, we lose the light airy crumb that makes this cake so special. So, do yourself a favor and store it, covered, at room temperature! It will stay fresh for up to 3 days! This French cake also freezes well. You can freeze it whole or cut it slices and wrap them individually in plastic wrap and then put them in an airtight container or bag. It will keep for up to two months. When ready to eat, thaw the yogurt cake in the fridge overnight and then let it come to room temperature before serving! 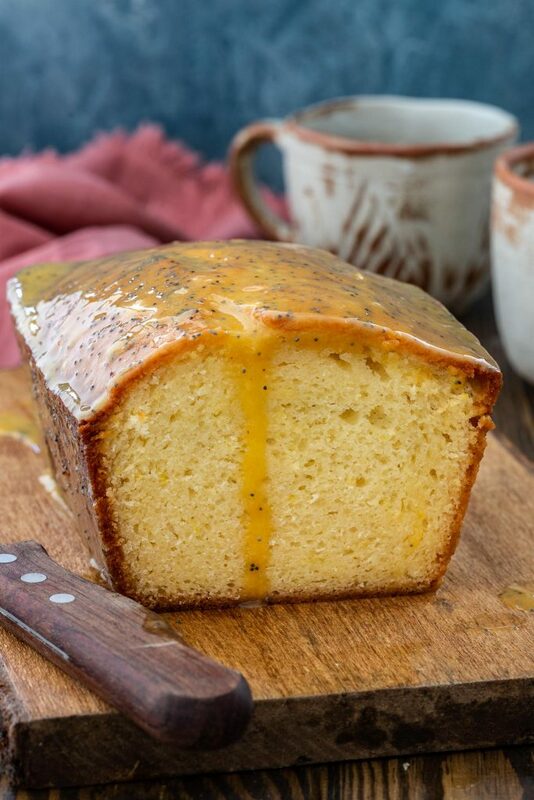 Moist, fluffy and slightly tangy, this French Yogurt Cake can be served with or without the passion fruit glaze. 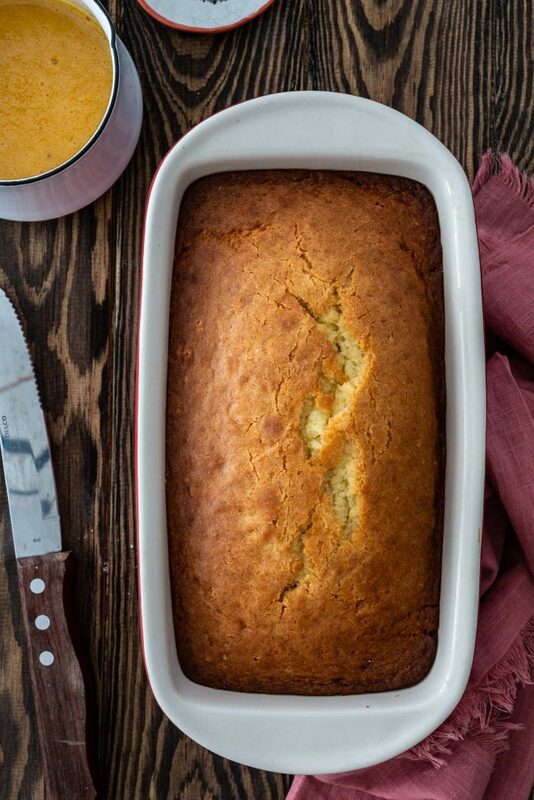 Grease a 9-inch loaf pan with oil or cooking spray. Reserve. Combine dry ingredients: In a medium size bowl, combine the flour, baking powder, baking soda and salt. Reserve. Combine wet ingredients: In a large bowl, whisk the eggs, sugar and lemon zest until pale and fluffy. Add the yogurt, oil and vanilla extract, whisking until smooth. Make the batter: Gently add the dry ingredients to the wet ingredients, using a wooden spoon. Mix until smooth, but be careful not to over mix or the cake can develop gluten and lose the fluffy crumb. Bake: Pour the batter into the prepared pan and bake for 50 to 60 minutes, or until a cake tester (or toothpick) inserted in the center comes out clean. Remove from oven and allow it to cool in the pan for 10 minutes. Then, carefully remove from the pan to a cooling rack, placed over a baking sheet. Glaze: If making the glaze, cook the passion fruit puree in a small saucepan, over medium-high heat, until reduced by half. Remove from the stove and stir in the confectioners sugar and yogurt, mixing vigorously until thick and smooth. 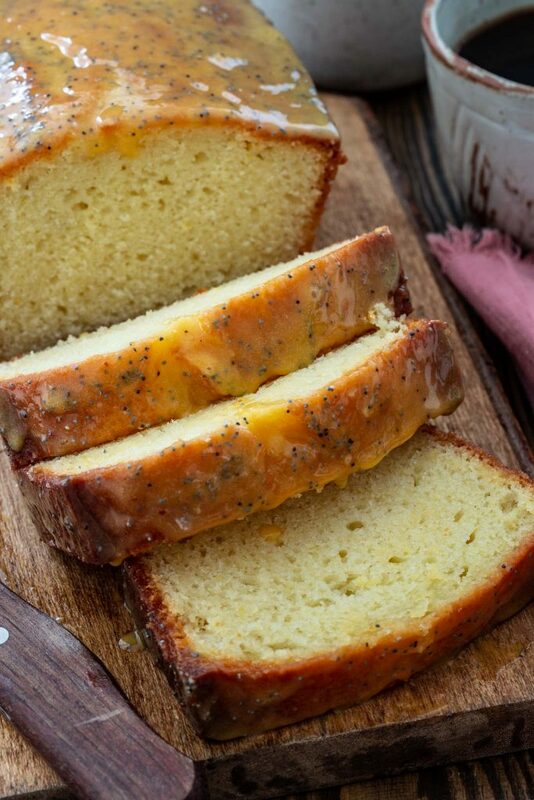 When cake is cool, pour the passion fruit glaze over it, sprinkle the poppy seeds and allow it to dry for 30 minutes before serving. Greek yogurt is not just for those Insta-worthy smoothie bowls! I use it a lot, to make all sorts of recipes, sweet and savory. Breakfast: yogurt bowls (my Pina Colada Smoothie Bowl goes great with Greek yogurt), yogurt parfaits, scones, muffins, biscuits and smoothies. Lunch and Dinner: salad dressings, dips (like my Seven Layer Mediterranean Dip or my Baba Ghanoush), soups, as a sauce for kibbeh, in curries or in marinades. Dessert: cheesecake, panna cotta, frozen yogurt, milkshakes. Or, ya know, just enjoy it right as it is, with a drizzle of honey and some homemade granola! Oh, you can’t beat that!